Popejoy Theater is an entertainment venue featuring Broadway and Off-Broadway shows as well as other theatrical and musical events. The Student Union Building boasts a state-of-the-art movie theater, ceramics studio, coffee shop, food court, convenience store, and plenty of space to hang out. Johnson Recreation Center offers a variety of services and classes that are open to the public. 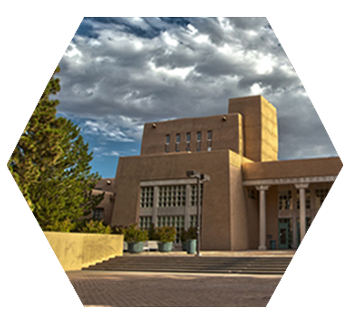 Several museums and galleries reside on UNM’s campus, including the UNM Art Museum, which houses the largest fine art collection in the state, and the world-renowned Maxwell Museum of Anthropology. For a complete listing, including days and hours of operation, visit: UNM’s museum page. As a Division 1 school, the University of New Mexico is home to many Men’s and Women’s sports teams, ranging from basketball and football, to swimming and fencing. Tickets for all sporting events can be purchased at UNM Ticketing Services. Hodgin Hall, UNM’s first building opened September 1, 1892 on, what then was, an empty mesa two miles west of town. Originally a redbrick building, it was converted to pueblo style in later years. Self guided and personalized tours are available. In 1994, UNM was designated as an arboretum. Self-guided tours are available. Zimmerman Library, opened April 1, 1938, is one of the finest examples of modified Spanish Pueblo-Revival style architecture. Visit the UNM Bookstore for spiritware, books, gifts, supplies, and more. The UNM Championship Golf Course is an 18-hole course with a pro-shop, and a casual eatery – the Lobo Grill. The UNM North Golf Course is a 9-hole course with scenic views and a newly renovated walking/running path.